Would you like to help further philanthropy while making great connections? 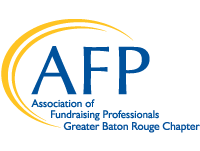 An AFP Greater Baton Rouge committee is the perfect place for you! Is event planning your thing? This is a strong committee who could use one or two more pairs of hands to pull off a stellar National Philanthropy Day Luncheon. Are you a social butterfly? The Membership committee needs more people to help plan mixers, networking events and other activities that add value to your membership. Do you like to get new projects off the ground? This committee will be implementing a brand new communications strategy and we need people to help put it into action. Is continuing education important to you? The Education committee needs one new person to help plan topics and speakers for our education sessions. If any of these opportunities interest you, please contact Tammy V. Abshire, CFRE, Chapter Administrator, at afpbatonrouge@gmail.com.